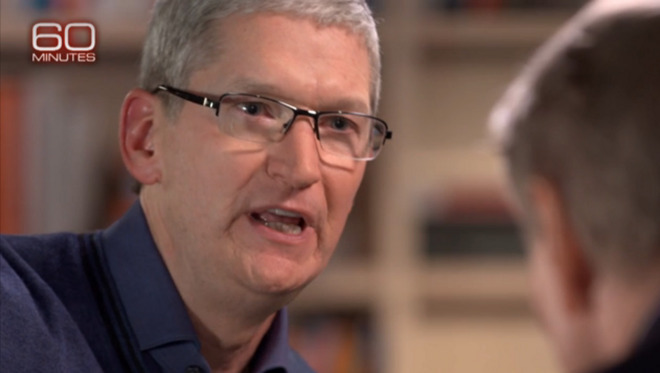 The full interview between Charlie Rose and Apple Chief Executive Tim Cook will air this Sunday, but CBS has posted a teaser clip from the conversation, in which Cook again defended his company's tax policies, stating that they pay more than any other company in a "backwards" system. Cook's aggressive comments are even more forceful than some he has made in the past, but the message remains the same: Apple pays every dollar it owes, and does not illegally avoid any U.S. taxes. He said the same more than two years ago, when he testified before the U.S. Congress. Cook's latest comments will air on broadcast television this Sunday on 60 Minutes, and a minute-long clip from the interview was shared online on Friday. During the conversation with Rose, Cook noted that his company pays more taxes than anyone else in the U.S.
"We happily pay that," he said. The question, however, centers around the money Apple earns overseas. More than $200 billion of it rests internationally, because repatriation taxes are excessively high, in the eyes of Cook and many other business executives. Cook told Rose that he would "love to bring it home," but current policies are outdated and unfair. "It would cost me 40 percent to bring it home, and I don't think that's a reasonable thing to do," Cook said. "This is a tax code, Charlie, that was made for the industrial age, not the digital age. It's backwards. It's awful for America. It should have been fixed many years ago. It's past time to get it done." After he testified before Congress in 2013, some politicians concluded that Apple was involved in a "scheme" to pay little or no taxes to the U.S. When questioned about that conclusion by Rose, Cook responded fiercely. "That is total political crap," he said. "There is no truth behind it. Apple pays every tax dollar we owe." Apple has been a vocal proponent of corporate tax reform in the U.S., but it's also faced scrutiny overseas. The European Union is in the midst of an investigation into Apple's tax practices, though Apple has also steadfastly denied allegations that it avoids taxes in Europe as well.